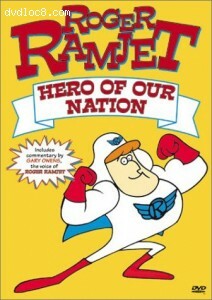 This page contains easter eggs for the disc Roger Ramjet - Hero of Our Nation (DVD, Region 1). From the main menu, go to "Select Episode", then pick either the "with" or "without" commentary option and onto the first batch of five episode titles. Instead of choosing an episode, move to the bottom where the "back", "next", "menu" etc are listed and move the cursor all the way to the left; a small jet symbol replaces the checkmark. Select it and hear Gary Owens burn up some recording studio time making loony answering machine messages for other people in the studio.